We have launched an exciting competition on our Facebook page offering entrants the opportunity to win a hamper packed full of delicious South West goodies. The hamper includes hot chocolate stirring spoons in a selection of tasty flavours from Kernow Chocolate, fruit juice from Heron Valley, a box of Thomas Fudge’s remarkable bakery cheddar cheese wafers, amongst many other delights, in a quaint wicker hamper. 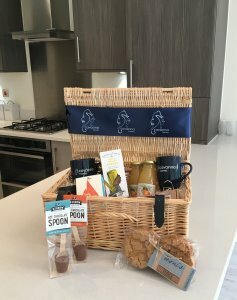 To be in with a chance of winning this prize, visit our Facebook page (https://www.facebook.com/CavannaHomesLtd/) and comment on our competition post – but don’t forget to also like the post before the deadline of 5pm on Friday 10th August 2018 to be in with a chance of winning. Please see full competition terms and conditions below. Good luck to everyone taking part! The lucky winner will be announced on Monday 13th August 2018 on the competition post and on Facebook Messenger by Cavanna Homes to confirm the exciting win, and any final details. By entering a competition on Cavanna Homes’ Facebook page, entrants are deemed to have accepted the following terms and conditions. Entrants must be aged 18 years or over to enter, and not employees of Cavanna Homes, their immediate families or their agents, or anyone else connected with the company. Please note, this competition is in no way sponsored, endorsed, administered or associated by Facebook. By participating, entrants are providing information to Cavanna Homes, and not to Facebook. Users must like the competition post on Cavanna’s Facebook page and provide a comment in response to the question. They do not need to like the Cavanna Facebook page, or tag someone in the post to enter and should they do so, this will not impact their choice of winning. To enter: reply to the competition question on the main Facebook page using a comment below the competition post. Submit your entry between Wednesday 25th July 2018 and 5pm on Friday 10th August 2018. There will be one prize drawn for this Cavanna Homes competition. The prize: the prize consists of one hamper, to be won by one entrant. Photographs are for illustrative purposes only, and exact contents of the hamper may vary. Winner selection: all valid entries received by Friday 10th August 2018 at 5pm will be entered into a prize draw. From this prize draw a winner will be selected at random by Monday 13th August 2018. Winner notification: winners will be notified on Facebook on the day of the draw, in the comments below the post, and a follow up message will also be sent on Facebook Messenger by Cavanna Homes to confirm final details, including the winners address. The winner will be required to respond within 60 days confirming their acceptance of the prize. In the event that a winner does not respond to communications or if any prize is declined, Cavanna Homes reserves the right to disqualify that winner and attempt to award the prize to a reserved entrant, subject to time restraints. Those entering are advised to check their direct messages on the day following the prize draw. If a previously confirmed winner for a prize contacts Cavanna Homes outside of the winner communication timeframe (as stipulated in clause 6), to then decline their prize, Cavanna Homes reserves the right to cancel that prize. Any expenses incurred by the winners, parents or guardian and any guest with regard to travel, and in the general use and/or enjoyment of their prize, are the sole responsibility of the winners and guests. Cavanna Homes may, in its sole discretion, disqualify entries deemed to be non-compliant with these terms and conditions and Cavanna Homes reserves the right to refuse entry to or disqualify any entrant whose conduct may be unlawful of otherwise bring the promotion into disrepute. In the event of such disqualification Cavanna Homes may award the applicable prize to another entrant. The decision of Cavanna Homes regarding any aspect of the promotion is final and binding and no correspondence will be entered into. Cavanna Homes accepts no responsibility for late, incomplete, incorrectly submitted, corrupted or misdirected entries. Any incorrect information provided will render the entry void. Prizes are non-transferable, non-refundable and cannot be exchanged for any cash alternatives in whole or in part. In the event that the prize winner does not take an element of the prize it will be forfeited by the winner and neither cash nor any other form of compensation will be supplied in lieu of that element of the prize. However, Cavanna Homes reserves the right to provide an alternative prize of equal or greater value in the event of unforeseen circumstances. If for any reason any aspect of this promotion is not capable of running as planned, including by reason of infection by computer virus, network failure, bugs, tampering, unauthorised intervention, fraud, technical failures or any cause beyond the control of Cavanna Homes which corrupts or affects administration, security, fairness, integrity or proper conduct of this promotion, Cavanna Homes may in its sole discretion cancel, terminate, modify or suspend the promotion, or invalidate any affected entries.